Note: The abovementioned parameters (lab-tested by using one Fenix ARB-L18-2600 rechargeable Li-ion battery) may vary between different environments. The white light mode is selected by default each time the lantern is turned on. In white light mode, doubleclick the switch to enter the red light mode, and then double click again to return to the white light mode. Red light: Click the switchto cycle through Red light →Red Flash. Operation:With the lantern switched off,remove the dust cover to reveal the charging port, and plug the Micro USB end of the USB cable into the lantern’s charging port, then connect the other end of the USB cable to a USB power adaptor. Charging Indicator: The indicatorsnear the switch willdisplay charging status. Four indicators willremain constant on when the battery is fully charged. 1. The normal charging time is about 2.5 hours from fully depleted to fully charged with the light off. 2. Only Low output can be used while the light is being charged, but charging time will be prolonged. With the light switched off, single click theswitch to check the battery status. The battery level indicators will display the battery status for 3 seconds. When the voltage level drops below the preset level, the first indicator flashes to remind you to recharge the battery. To ensure normal use, the lantern will not turn off automatically and will work till the battery level runs out. Disassembling the sealed head can cause damage to the lantern and will void the warranty. Fenix recommends using excellent-quality batteries. If the light will not be used for an extended period, remove the batteries or the lantern could be damaged by electrolyte leakage or battery explosion. Replace the dust cover when charging is complete to ensure waterproof and dustproof performance. 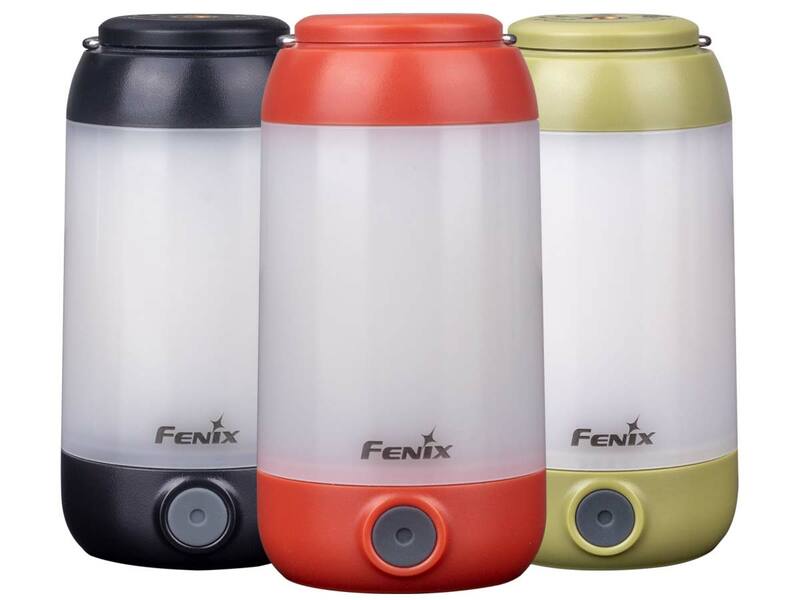 This camping lantern is a high-intensity lighting device capable of causing eye damage to the user or others. Avoid shining the camping lantern directly into anyone’s eyes. For utility uses only, I’d give it 10 stars. You can see and navigate with ease no matter how dark your environment is. The power source is great, you can carry extra 18650 batteries to slap in if you need to. You don’t have to take an extra charger — the lantern can charge the 18650’s from a USB power source – I haven’t tried to charge it yet from my solar panel but shouldn’t be a problem. For relaxing camping, it only gets 4 stars. The light is so bright it borders on harsh. It definitely needs another level of brightness between medium and high — it’s missing that “Goldilocks” zone for comfort camping. It also needs tint warm up, at least a +1 or +2 of yellow, and a tad higher CRI. Unique, nice form factor, and very powerful for a multi-directional lantern. Classic Fenix excellence. A nice small handheld unit. Puts out great light levels. Use a 3500 mAh cell for best runtimes. Nice overall build quality.